With high usage of internet and audio technologies, companies are piled up with audio and video files. The spoken language source needs to be transcribed for further processing or reference. The transcription becomes mandatory to avoid disputes or lawsuits later. Most industries are in need for transcription services. At Infognana, we understand this need and offer accurate and timely transcription services, fine-tuned to your industry. Infognana’s transcription services are geared to produce accurate transcripts from audio and video recordings. We have been in business for 12 years and have transcribed over 12 million pages. Serving companies across the globe has given us extensive experience handling various language accents and nuances. With advanced audio-editing software, we enhance challenging audio in order to deliver the best possible transcript. Call us now and communicate your transcription needs… An ideal transcriptionist will start processing your file right away! Having a transcription of your video provides textual information about the content of your video. This information is used by the search engines to clearly understand what you are talking about. So, when someone is looking for what you are talking about, your video is identified and listed… all because of the video transcription. The transcripts are created by closely watching and keenly listening to your video. Timestamps are added for easy identification and reference. Got a recording of an interview in hand? Looking for a good transcription service for further analysis of interviews? Infognana, can serve to be the right transcription partner to convert all your interviews to an editable document. Give us the tedious task and we will simplify the process with the most desirable result. We process interviews involving multiple speakers and the transcripts are developed using timestamps and speaker names for easy identification. We have expertise transcribing journalist interviews, Celebrity interviews, phone interviews etc. Contact us now and tell us your requirement to start the interview transcription. The invaluable messages from seminars need to be recorded and produced in real text format for the benefit of many others. Every aspect of a seminar cannot be assimilated and attendees may want a replay of the seminar in order to grasp the important points. The significant task of information capture is well achieved with seminar transcription service at Infognana. We accurately capture every bit of the seminar with regular timestamps for easy comprehension. Our transcriptions can also be formatted into books or any other material as per your request. So… get the content of the seminar in the most precise and accurate manner. Call us now and talk to our seminar transcriptionist to get further details about our service. Students face different challenges with note taking and comprehension during lectures. It becomes absolutely necessary to aid students to catch up with what they missed in important lectures. Recording and transcribing lectures can improve retention and success for students. Want a transcription of your group discussion? Outsource your tasks to Infognana… We have extensive experience providing focus group transcription services to clients worldwide. Our transcriptionists accurately record every insight, no matter how many people are talking. Handling complex conversations, tricky accents and overlapping speeches have been our way of life and we have mastered it over these years. Contact us and get your focus group transcription within the shortest time-frame! The corporate world encounters endless meetings, interviews and seminars which produce large amount of audio and video content. It is important to create appropriate records of the proceedings as the information is incredibly important. Infognana offers professional business transcription of your crucial data with strict deadlines and high security. Religious institutions work to spread their message and grow their congregation in this rapidly changing culture. Sharing transcripts of sermons and other speeches can be a powerful outreach tool. Transcription of sermons not only provides an archive for the future, but also opens up the religious message to a broader audience. Give your community the opportunity to re-experience your words through text. Send us your video or audio of sermons and other gatherings and we will transcribe them in your preferred format at 98 to 100% accuracy. Call us now and start sharing your words with a wider community instantly! Insurance investigations results in numerous critical files that needs to be recorded and stored securely. Infognana offers insurance-related transcription services promptly delivered with high quality and reasonable pricing. We understand the importance of every word stated and ensure that the recorded statements are transcribed in a timely manner by our professional transcriptionists. 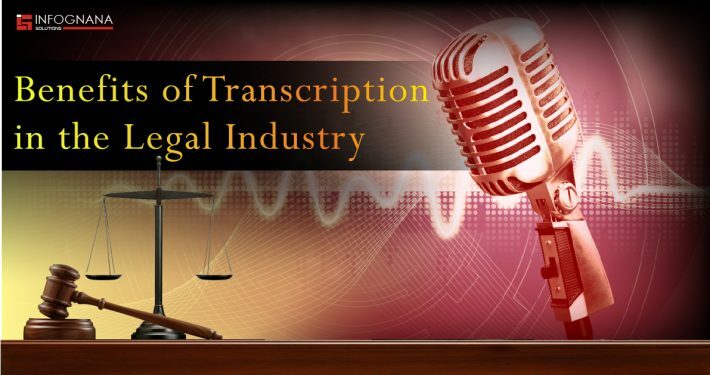 Looking for a transcription service that has good experience with legal terminologies? Infognana can take up any legal and law-related recordings and transcribe as per your requirement. Our experienced and competent legal transcriptionists are well trained with the legal terminologies and can provide an error free document. Our services are committed to prompt legal document preparation with an unsurpassed attention to detail. Our transcriptions are presented in a legally accepted standard and ensure privacy and confidentiality of client’s data. Infognana has demonstrated excellence in providing all forms of transcription services to leading production houses all around the world. Our entertainment transcriptionists skillfully transcribe any content relating to media and the entertainment industry. At Infognana, we take pride in giving fast, accurate, secure and affordable transcripts as per your requirement. Getting started with us is easy!Call or email us and we will start the transcription right away! Get your transcripts back in just 24 hours! Send us your audio files after every working day and drive back home peacefully. You will find your completed and proofed transcripts, sitting prettily at your desk when you walk in to office the next day. Our standard TAT is the most preferred turnaround time of our clients as it fulfills a dream of most medical practitioners. Perfect clinical documentation while they sleep! Need your transcripts real quick? You can bank on your old friend! We offer rush turnaround time to help you handle documentation contingencies. You can receive a perfect transcript in just 12 hours! You read that right, the 12 hours it usually takes for you to make it to your office in rush hour transcript. If you need your transcript very fast, choose emergency TAT, we can deliver your transcript in 6 hours. Transcription services at Infognana are straightforward with a transparent process. We provide up-front pricing without any hidden fees. Our transcription experts work in conjunction with the quality team to provide 99% accurate results within the specified timeframe. An ideal transcriptionist is assigned to every project to provide accurate results. The processed file is verified for accuracy by qualified professionals to ensure 99% accuracy. We have good experience in understanding and deciphering different accents and dialects. Our highly skilled transcriptionists have expertise handling various nationality slangs and other cultural nuances. Get a good sync of the text with your audio, with timestamps/ markers at regular intervals. We offer timestamps based on your request. Our transcription goes through multiple stages of quality analysis to ensure error free transcription of your audio/video files. We provide speaker identification to help you identify the speakers in the transcription. The identification can be specified based on the role or the speaker name. Our transcription is based on intense research into related subject to verify the accuracy of subject-related terminologies. The transcription can be formatted based on your requirement. We provide verbatim transcription which includes fillers, repetition and every expression; or, a clean transcription that is easier to read without expressions and fillers.